The world is your oyster. At least it is for Tyler Ortego, Matt Campbell, and two professors at Louisiana State University, who invented the OysterBreak system in 2005 and brought coastal protection to life, literally. The system, which is essentially a chain of huge linked concrete cylinders, is made of an oyster-growing substrate that, once installed, is colonized by oyster larvae and eventually grows into a living reef. Because these solid reefs grow faster than sea levels rise, they reduce shoreline erosion. ORA Estuaries, the company that Ortego founded in 2010 to run the building and distribution of the oyster reefs, recently won The Big Idea pitch competition at the 2015 New Orleans Entrepreneur Week. As of yet, the oysters can’t be eaten, but Ortego is working on engineering the reefs to double as a sustainable food source. New Orleans residents say that Hurricane Katrina created 20 years of waste in a single day. True or not, the disaster left the city sitting on over 55 million tons of debris. Enter The Green Project. Founded in 1994 as a paint-recycling business, the New Orleans-based nonprofit stepped up after Katrina, taking materials from destroyed homes and reinvesting them into community rebuilding projects. Ten years later, The Green Project is thriving. The project promotes creative repurposing and prides itself on being accessible to all populations–materials are sold to community members at one-fifth of new retail costs. It also has the only paint-recycling program in the Gulf region and leads regular community recycling education workshops. We agree, it’s pretty much the whole package. It wouldn’t be New Orleans without stormwater management. In 2013, Global Green USA launched its Water Wise NOLA program in New Orleans to advocate for simple solutions to water-related issues, such as flooding and substandard water quality. The organization is working to help residents lower their water bills by reducing consumption and promoting rainwater management. And they host regular rain-barrel builds–does it get better than that? Don’t worry; the city government is making an effort to green-ify New Orleans, too. After Hurricane Katrina devastated the city’s public transportation system in 2005, the Regional Transit Authority was tasked with a massive reconstruction project. Although the bus service is still operating at 35% of pre-Katrina levels, the RTA has made progress. Today, the transit network’s entire fleet is run on biodiesel and sixteen of their buses are biodiesel/electric hybrids. The city has also made pedestrian-friendly improvements to its streetlights. Since 2014, over 4,000 of them have been replaced with energy-efficient LED lights as part of the city’s ongoing Energy Smart Streetlight Conversion Program. We’d call that a step toward a brighter future. At Waste to Energy Systems, we are constantly looking for ways to be green and sustainable no matter how big or small the change. Sometimes it is the simplest change that can make a big impact! A recent one popular way to be green is as simple as buying the “ugly” produce on the super market aisle. A recent article discusses how picking up that strangely shaped potato or knobby tomato can make a huge difference in cutting down on food waste, a huge issue in the world. One of the simplest things you can do to help the planet thrive is to demand uglier produce. Buy the apple that has a funky knob coming out of its side. It’ll taste just the same as its cosmetically pleasing counterpart. Then tell your local grocer you want more uglies. “It’s the low hanging fruit of sustainability,” as Jordan Figueiredo, the co-chair of the Zero Food Waste Forum, punnily puts it. Figueiredo and his partner Stefanie Sacks, a culinary nutritionist, are currently campaigning for a decrease in ugly food waste on Change.org. Their petition, which has more than 44,000 supporters as of August 6, is pushing big food retailers Whole Foods and Walmart to sell “less than perfect”-looking produce in their stores. Discarding uglies isn’t good for our planet. When dumped into landfills, they decompose and produce methane, a gas that is 21 times the global warming potential of carbon dioxide. Methane absorbs the heat of the sun, further warming the atmosphere. That’s not to mention the water used in the farming process just to produce food that’s thrown away. According to the UN, the water required to grow food that’s eventually wasted (not just uglies, but all food that winds up uneaten) equals three times the yearly flow of Russia’s Volga River. Food waste is a colossal issue: Americans waste about 40 percent of their food, according to the Natural Resources Defense Council. That’s enough food to fill 730 football stadiums. Yet in 2013, 49.1 million American lived in “food insecure” households, meaning they didn’t have dependable access to a commensurable amount of food. Instead of being thrown away, uglies can successfully be sold at a discount, making food more affordable, and farmers would be able to profit from more of their harvest. The message in all of this seems to be the same one we’ve been taught since our pre-school days: Don’t judge a book by its cover. Eating ugly is a simple, proactive way to begin to undo the trauma we’ve forced upon our planet. There’s much more you can do to conserve and help the earth heal, but you can start by signing the petition and eating ugly. Landmarks have always played a key role in a city’s economics because they draw tourists, which in most cities like Paris, Rome, and London plays a huge part in their yearly income. However, the unexpected cost of keeping these landmarks light up, running and awe-inspiring is the environmental impact. The Waste to Energy Systems team wanted to highlight those landmarks that are making the effort to stop making a negative impact and become an attraction for their green initiatives as well. From the Huffington Post article, “The Eiffel Tower Just Became A Little More Green. Here Are 8 Other Landmarks That Did It First”. Two wind turbines have been successfully installed on the Eiffel Tower to offset some of the structure’s energy use, are expected to produce 10,000 kWh annually. This will offset the power used by commercial activities on the tower’s first floor. The project is part of a larger efficiency upgrade that also includes LED lighting and rooftop solar panels on a visitor pavilion. 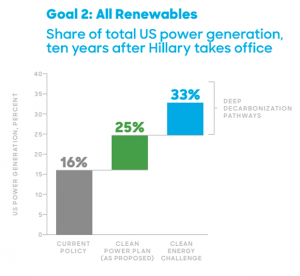 A continuation of the Guardian’s article “Is Hillary Clinton’s ambitious solar energy goal for the US workable?”. We pick up again in the article with the second goal in the plan. Speaking to reporters on Monday, Clinton noted that further federal investment would be needed to incentivise the sector’s push to 33%. In a fact sheet, the campaign flagged the resuscitation of tax credits and some innovation and regulatory incentives. “That [the return of tax credits] is hardly a sure thing, given that at least one chamber of Congress will inevitably be Republican controlled during at least the first two years of any new president’s term,” said Zindler. Jürgen Weiss, Brattle Group consultancy Jürgen Weiss, head of climate change at the Brattle Group consultancy, said incentives were important as the industry remained relatively tiny, with low public awareness. A large percentage of costs for installers of residential solar are wrapped up in selling the technology to a sceptical public who have relatively low electricity costs and little concern for climate change. “The big part is convincing people to sign up in the first place. People in the US may care less about climate change than they do about cost,” he said. Although the technology, regulatory and labour costs are roughly similar, the price of installing residential solar in Germany (where high electricity costs, strong public acceptance and large government incentives have driven a huge push to solar) is around $1.50 (£1) per watt cheaper than in the US. Even if half of Clinton’s target of 140GW of solar by 2021 were to come from residential (as opposed to utility) solar panels, that equates to a cost difference of more than $100bn, mostly spent on advertising and sales. John Reilly, an energy economist at the Massachusetts Institute of Technology, said the targets would be a challenge “in terms of providing incentives to build that much”. Weiss said: “I do think those costs will come down as the market matures and people get more informed.” The danger, he said, was providing too much tax-payer funded incentive early on. In Germany and the UK, the solar industry has come under political pressure for being too successful when subsidies were high and now suffers from accusations of being a ‘subsidy junky’. It’s important to clear up some ambiguity in the Clinton rhetoric. From her renewables campaign video, “a 10-year goal of generating enough renewable energy to power every single home in America” does not mean every home is going to have its own clean energy supply. The residential sector uses roughly a third of the total electricity generated. So a 33% renewable goal means the country will be generating this much clean energy, but not all of it will end up in homes. But factories and office buildings don’t vote and the promise, as my colleague Suzanne Goldenberg points out, allows Clinton to sound like she’s liberating bill payers from utilities. It is also clear that Clinton’s focus on solar (as opposed to wind) is aimed at the voting bill payer. Solar even garners support among some Republicans because of the freedom it offers from regulation and bills. The Department of Energy has found that wind energy can affordably reach 20% of electricity generation by 2030. And, under Obama’s Clean Power Plan, the Energy Information Administration (EIA) predicts it will be the biggest contributor of new renewable capacity throughout the 2020s. As part of her announcement, Clinton pledged to uphold the Obama administration’s heavily-opposed restrictions on the carbon emissions of power stations, which are expected to accelerate the already rapid shut-down of coal plants across the country. This capacity will mostly be taken up by cheap gas, but there will be space for renewables if they can compete.